"Creativity is not just something you think about – it is something you do." 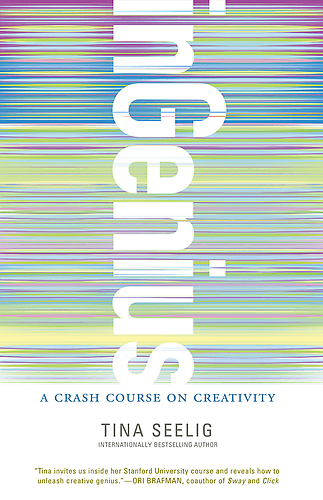 Seems sort of counter-intuitive – a book to teach you how to be more creative. Isn’t that the point of creativity? To be unbound and not stifled by rules and procedures, to allow ones’ mind to become free and open, taking in and applying all the possibilities? That’s true – but how do you get to that “free and open” state? How does your mind open to that potential, that whole “outside-the-box” thinking and creatively solve problems without applying logic or structure or boundaries? It’s this that Tina Seelig teaches us in her new book, inGenius: A Crash Course on Creativity; that the secret to creativity is learning how to stretch your mind. 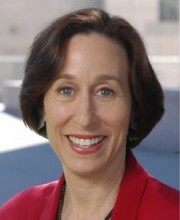 A follow-up to her widely read (and ActionableBooks reviewed), What I Wish I Knew When I Was 20, in inGenius, Seelig introduces us to some of the things she teaches her students in the Stanford Technology Ventures Program at Stanford University and the theory and discipline behind creativity. "Creativity can be enhanced by honing your ability to observe and learn, by connecting and combining ideas, by reframing problems, and by moving beyond the first right answers." “Your knowledge provides the fuel for your imagination. “Your imagination is the catalyst for the transformation of knowledge into new ideas. “Your attitude is a spark that sets the Innovation Engine in motion. “Resources are all the assets in your community. “Habitats are your local environments, including your home, school or office. 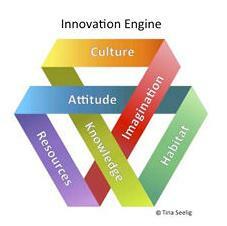 Basically, what Seelig explains in clear, concise language is that in the inside of the Innovation Engine are the parts of you that enhance creativity. It’s up to you to apply the thoughts, mind-set and creative thinking to the factors on the outside of the Innovation Engine – factors outside your control but those that have influence over your everyday interactions. By focusing on the factors you can control, you can learn how every moment provides an opportunity to creatively respond in any situation. "The space told a powerful story, and each team dutifully placed itself inside that narrative." Like many in the Actionable Books community, I’m a self-employed entrepreneur. One of the hardest lessons I had to learn when I quit my corporate job and moved to my home office was what environment, or habitat, I felt most productive in. Was I full of motivation and creative energy sitting on my couch with my laptop or at my desk in the office upstairs? Did sitting on the back deck with music in the background distract or focus my attention? Turns out, the best place for me to work was the island in my kitchen – close enough to the fridge for a snack when I wanted, in a wide open space where I didn’t feel constricted by four walls but still at a workspace where I had to sit up and pay attention. Habitat makes a lot of difference when it comes to creativity and innovation, a powerful thought Seelig proved by accident during a simulation game in her class. She’d broken the class into two groups where they had to complete jigsaw puzzles in the shortest amount of time. One group was on the side of the room where there were small tables but no chairs and the other group worked with chairs but no tables. Each group completed the same puzzles but in completely different ways. No matter how often participants go through this activity, the result is the same – the team with the chairs and no tables immediately start to collaborate, pushing chairs out of the way and working together on the floor. The team with the tables stay at their tables, not leaving those spaces nor collaborating together at all, thus limiting their number of points earned. When the activity is over and Seelig points out the phenomenon, participants are always shocked to learn how the habitat they work in has such a profound effect on the way they operate. "In fact, believing that there is a solution to your problem is a critical step in finding one." Has anyone seen those bus shelter ads lately for Mike’s Hard Lemonade? The ones that say “If it ain’t broke, break it.”? I think the creativity behind those ads is great – Mike’s is asking us to be creative and push the limits of the status quo to create something different and unique. Did you know that Mike’s Hard Lemonade was a game-changer in its day – the first malt-based cooler to be sold in grocery stores in the US? Previous to Mike’s, coolers weren’t sold in grocery stores as only wines and malt-based beverages (read: beer) were legally allowed to be purchased outside liquor stores. So what did Mike’s do? Replaced the vodka-based alcohol in their beverages and put in a malt-based alcohol, thus meeting the regulations established by the liquor boards and increasing their distribution by phenomenal rates. Game changer. You must first believe that you can find solutions to any problem, know that you’re not limited by the boundaries you’ve constructed around a situation and open your mind to potential. It’s about attitude – “having the conviction that problems can be solved” (page 170) – and not allowing a closed mind stop you from changing the game. At the end of the day, doesn’t everything come down to attitude – changing the way we think and behave in new and creative ways? It’s about using the factors we can control – knowledge, imagination, habitat and attitude – and learning how to put those together with our resources and cultures to create new and innovative approaches to life. By learning about ourselves and breaking through our personal limitations, experimenting with established practices and changing our perceptions and outlook of the world, we have “the power to overcome challenges and generate opportunities of all dimensions” (page 201). Change the game.